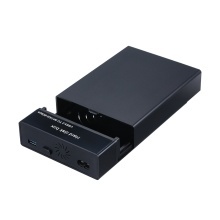 This external hard drive enclosure can easily connect 2.5/3.5 inch hard drive to your PC, laptop and other devices to transfer data quickly. USB3.0 6GB transfer rate, and support UASP new protocol and 10TB large capacity storage. Plug and play with tool-free installation. No tool is required, 3 seconds disassembly. Built-in high-power wide-voltage power supply, support SATA interface 2.5/3.5in mechanical hard disk and SSD hard disk, up to 10TB hard disk. Intelligent chip reduces hard disk loss, and automatically wake up when reading and writing data. Support Windows, Mac OS, Linux system computers and smart TVs, routers, PS4,HD players, etc.